'This excellent primer offers useful, simple practical advice: where to start, how to know how you're doing, and how to take simple steps to improve care for patients. It will be useful and used by clinicians across the health service.' Professor Martin Roland, in his Foreword 'The concept of clinical governance places a central responsibility for quality on the shoulders of those managing and leading within the health system. To one degree or another, that means all of us.' From the Introduction This book provides readers with an invaluable set of tools to convert the endless challenges for quality and myriad opportunities for improvement into meaningful and useful change. It begins by considering how to manage primary care organisations in order to improve quality of care. Patient perspectives on quality are examined initially, moving onto market mechanisms and commissioning which are increasingly being used as levers for change. It also considers how general practices are regulated and held accountable for the quality of the services they provide. All healthcare professionals work within teams, organisations and the wider health system. How these are designed and managed greatly determines individual and team effectiveness. Refl ecting on this, leadership, management and the right organisational culture are reviewed. Prompts for personal refl ection are included throughout the book, enabling practitioners and students to use personal experiences to transform the services provided. It also explores various techniques used for assessing and measuring quality of care, commonly used quality improvement frameworks along with the burgeoning sciences of process control, systems and spread. 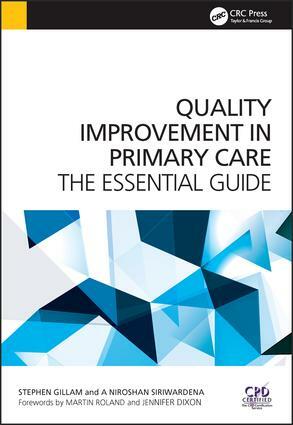 Quality Improvement in Primary Care is a highly practical introductory primer for quality improvement, relevant to every individual working and learning in primary healthcare and the wider health service.